In a return to the days of Ari Vatanen’s famous ‘Climb Dance’ short film, Peugeot will return to the famed Pikes Peak Hill Climb on 30 June in the United States with Sebastien Loeb. The nine-time World Rally Champion and Citroën legend will drive for the sister Peugeot brand in a specially designed and built 208 T16 in the ‘Unlimited’ class. It will carry the number ‘208’ with a sole objective of victory. Vatenen’s unforgettable record-breaking victory on the 1988 event in the 405 T16 is documented by the celebrated film, ‘Climb Dance’. Peugeot won the famous Colorado hill climb a second time in 1989, this time with the USA’s Robby Unser behind the wheel. Now with the unique 20km and 156-turn course totally sealed, the climb from 2,800 metres to 4,300 metres was too good an opportunity for the French maker to pass up. The Pikes Peak Hill Climb is the USA’s second-oldest motorsport competition after the Indianapolis 500. “Pikes Peak is a one-off outing which has the potential to generate extensive media coverage and which meets the constraints of the current context,” said Peugeot Brand CEO Maxime Picat. “It is a legendary race that has inspired all the Brand’s teams who have mobilised behind the project which targets outright victory. It is also a tough, exceptional challenge which leaves no room for error. In other words, it’s exactly the sort of challenge that Peugeot adores. 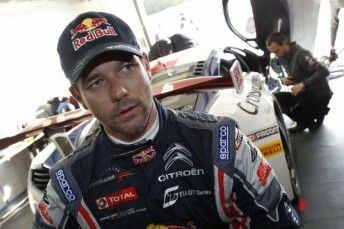 Loeb is only running a limited WRC program in 2013 for Citroën. He is still keeping his eye in, including this weekend in the FIA GT Series at Nogaro in France where he will drive a McLaren. Loeb’s only motor sport foray into the US was last year’s X-Games where he won gold in the rally car race on the streets of Los Angeles. The 208 T16 Pikes Peak is to be unveiled in the middle of April.